Classed-up and mellowed-out. 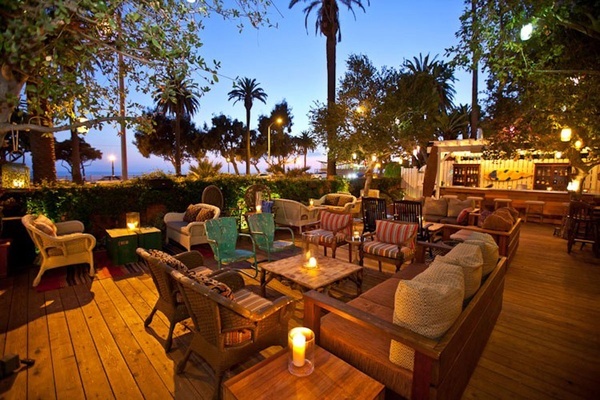 All photos courtesy of Fairmont Miramar Hotel & Bungalows. In the City of Angels, the name of the game is maxing and relaxing. Look no further than the newly renovated Fairmont Miramar Hotel & Bungalows in Santa Monica, where there's a world-class fitness center, excellent restaurant, killer views of the Pacific, and good vibes. Set at the edge of Santa Monica — with sweeping views of the Pacific Ocean in the distance — the Fairmont Miramar Hotel feels like a real Hollywood hideaway due to its unique bi-level bungalows and leafy surroundings. You'd typically have to stay much further inland, in Beverly Hills or Bel-Air, to achieve this kind of blissful seclusion. Upon arrival, I was whisked past a truly enormous fig tree and into a world of manicured gardens, Exhale spa treatments, and delicious meals at the light-filled FIG — the hotel's destination-worthy restaurant where LA power brokers do deals over breakfast. The Miramar is an ideal spot for a romantic rendezvous, families who want beach proximity, or anyone doing business in West LA. I left feeling completely rested and refreshed after just two days. 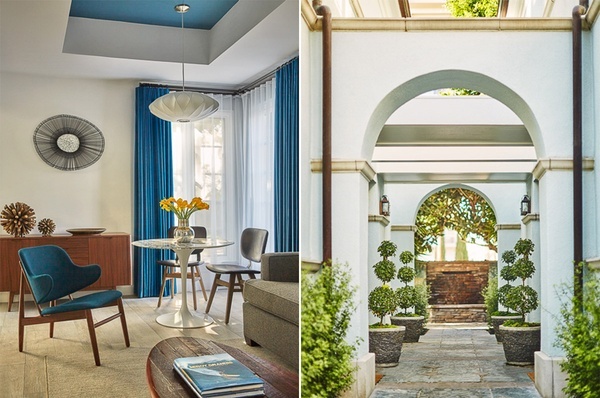 The hotel's 32 bungalows — four being bi-level suites suitable for families — have just seen a complete renovation courtesy of LA-based interior designer Michael Berman. Past the amorphous swimming pool, these soothing spaces are tucked away at the back of the hotel property and have a minimalist, modern aesthetic, offering every possible amenity. 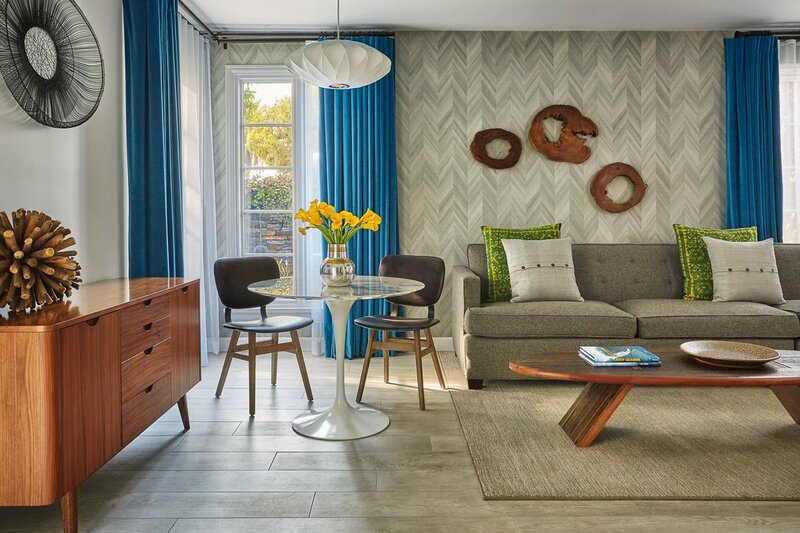 Built in 1938, the bungalows have stood the test of time and are still incredibly cool: a new, lightly colored palette, natural wood finishes, and mid-century modern furnishings and light fixtures make each of these bungalows feel like a comfortable home away from home. The Miramar is a self-contained campus that you'll likely never want to leave. Between an expansive fitness center, excellent chopped salads, and the spacious accommodations complete with private terraces and balconies, a stay here feels like a sweet escape. A shaded swimming pool area offers a lively scene in the summer months and all of the sun umbrellas feature festive Villebrequin patterns. The fitness center deck overlooking the pool is an ideal spot for stretching and morning sun salutations. Anyone in search of an exercise class will be spoiled for choice at Exhale on the ground level. Starlets flock here for the rigorous Core Fusion Barre + Cardio classes, but there is something for everyone. I highly recommend Flow Yoga for less committed types. The parking valets are top-notch, which is everything in car-centric LA. The concierge team is happy to facilitate hard-to-score bookings at Bestia, the hopping Tower Bar, Gjelina in Venice, or Brentwood brunch staple Farmshop. You'll never want (or have) to leave the premises. Curl up with a good book with the sound of waves crashing against the shore. There is nothing hotel-like about the food at Miramar. Head to FIG for Chef Yousef Ghailani's creative, Lebanese-inspired fare. I became a particularly big fan of the hearty breakfasts. The Santa Monica special with an egg white scramble, chicken-apple sausage, and fresh berries was delicious, as was the frittata packed with farmer's market vegetables and a piquant tomatillo-avocado salsa. Say yes to a bountiful California breakfast. How's this for a nice dining option: heated terraces overlooking the property. Because my room was so cossetting, I once opted for a room service dinner and was delighted by the delicious simplicity of a seared tuna Niçoise salad with a side of perfectly crisp fries. There are so many excellent culinary finds within walking distance of the hotel that it's absolutely necessary to get out and explore, but one could happily subsist on the excellent fish tacos and well-executed hamburgers for at least a week without leaving the hotel. The Miramar is comprised of 302 rooms but it somehow manages to feel intimate and not the least bit chain-like. The Bungalows feature enormous king-sized beds swathed in crisp white linens, flat-screen TVs, minibars, and bar carts. As the iconic bungalows were just redone last summer, everything is spotless — the wood floors, neutral carpets, even the comfortable Danish modern-inspired chairs sprinkled throughout the living room areas. All of the rooms are set up for people who work: easy Internet access, multiple power sources, and good task lighting. In addition, it should be noted that the Bungalows are attended to morning, noon, and night. I stress-tested the system when I locked myself out of the top floor bathroom at 3 a.m. As it has a heavy door with a dead bolt lock that I somehow managed to click in the wrong direction, I worried that I wouldn't be able to gain access to my contact lenses, valuables, and assorted toiletries for hours. One call to maintenance and two workers were at my doorstep in a matter of minutes. Problem solved. I was upgraded to the spectacular Bungalow 24 — a bi-level room (a house, really) — complete with a sitting room and bathroom downstairs, and a bedroom, bath, and outdoor terrace upstairs. 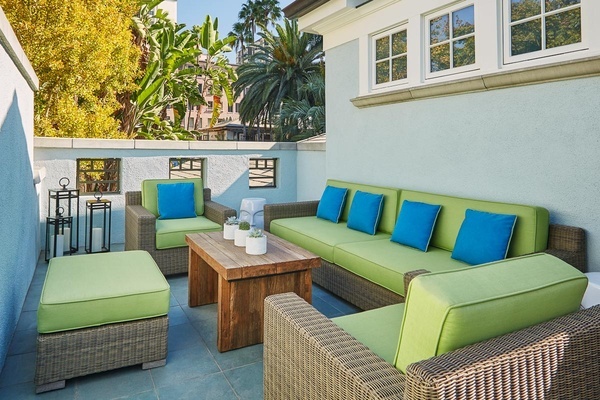 This patio, with its wicker and bright canvas couches, proved difficult to leave, as my views of swaying palm trees and the sea were so relaxing. Bungalow rates range from $900 to $5,000 per night, with the Presidential Suite being the swankiest of the inventory. I toured this space — a 3-bedroom combination — and it is also perfectly set up for families, with plenty of doors, separate bathrooms, and no stairs in sight. I also stayed in the main part of the hotel on a separate visit, in one of the 400-square-foot Palisades rooms. The spaces offer great value for money, as well as little wet bar/kitchen areas that are perfect for extended stays. As with all of the rooms at Miramar, they are quiet. The hotel seems to draw a mellow, early-to-bed crowd. But be sure to request one of the freshly updated rooms in this newly updated hotel. Families, business travelers who want peace and quiet as well as excellent Wifi, couples looking for a romantic escape, and anyone in need of a good workout/detox. Anyone looking to rage, although you can find a party scene at the adjacent Bungalow lounge and bar at the far edge of the hotel property. This indoor/outdoor club has a SoCal vibe and is hopping from 5 p.m. onward, but doesn't create noise or impact hotel guests in any way. The Chateau Marmont this hotel is not! Tiki party anyone? Grab a drink at the bar and chill out on the patio. The Santa Monica Pier has easy bike rentals (making it great for families), and people-watching in nearby Venice Beach. The Santa Monica Farmer's Market is a hit, too, with pony rides and insanely tasty tacos. The 3rd Street promenade area has all of the basics: a mega-plex movie theatre, bookstores, and chain restaurants. There are also smaller, niche shops — Fred Segal, for one — that shouldn't be missed. I still love Ivy by the Shore for upscale pizzas, the best chopped salad in town, and ice cream sundaes that remind me of my youth. At Shutters on the Beach just down the street, the lively bar and cafe are great places to get a drink and watch the scene-y LA world go by. If you're feeling like something simple, Joan's on Third makes an excellent, affordable breakfast as does the iconic Cora's Coffee Shoppe across Ocean Avenue. Be sure to sit outside under the trellis and sip one of the best ice coffees ever. Cora's huevos rancheros deserve a shout-out as well. Huckleberry remains a lunch favorite for excellent salads and inventive sandwich combinations and nearby Montana Avenue is full of great takeaway options. Menchies — the ultimate DIY frozen yogurt bar — brings out the kid in everyone, while dinners of hamachi crudo and housemade pappardelle at Aestus are to be savored by an adult crowd. Gjusta in Venice — the bakery and deli from Gjelina chef Travis Lett, is completely worth the wait. The homemade buttermilk biscuits, breakfast mushroom bowls, and the porchetta melt are to die for. Worth traveling a bit further afield: Shoppers will love The Elder Statesman for exquisitely hip cashmere in a bungalow-like setting, as well as the funky-chic RTH — a hybrid shop full of one-off leather goods, ceramics, and incense that wafts down La Cienega Boulevard. Brentwood Country Mart is another favorite, with delicious lunches at Farmshop a must. Jenni Kayne sells beautiful sweaters and suede boots, while Poppy Store offers a carefully curated selection of hip kids clothing. Edelweiss Chocolates is always a good idea, too! There is so much happening on the cultural front in LA right now, it is making New York and London look tame. Don't miss the Robert Mapplethorpe: The Perfect Medium exhibit at the Los Angeles Museum of Contemporary Art that will be co-curated with The Getty. The Broad is worth the hype to see the Diller Scofidio + Renfro-designed spaces. Recharge at Otium next door for a delicious meal by French Laundry vet Timothy Hollingsworth. Pamper yourself in this plush bungalow space. You might end up saving money by just using Uber vs. renting a car and paying for all of the parking. Uber is incredibly affordable in LA and they're everywhere, instantaneously. If you're doing serious distance driving, then hire one from the affordable Midway in Santa Monica. They'll pick up and deliver to your hotel, no hassle. Los Angeles International Airport is 20 minutes away with no traffic. Be sure to hit the In-N-Out Burger that is literally feet from the airport runway because nothing says "Welcome to Cali!" like a double burger, no bun. This is LA — a car of some kind is essential. 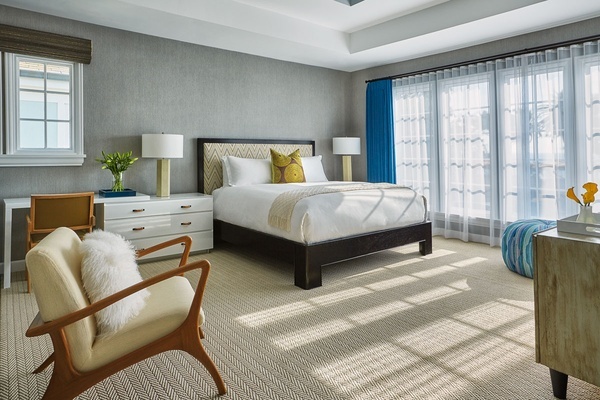 Rooms start from $439 per night for a standard double, or $5,000 per night for multi-room suites. Click here for reservations.